As you travel, live, and make native friends in Mexico, you will begin to receive written correspondence that might surprise you. Mexicans are indisputably more expressive, even sensual in their writing, and that takes some getting used to. Not all cognates are created equal. The verb ‘desire’ is used more informally in Spanish than in English. “Tengo tanto deseos,” literally “I have so many desires,” just means “I’d really like to…” But it sounds so much more...passionate in Spanish, doesn't it? Until my Mexican girlfriends began to communicate with me the same way, ending their e mail communications, even when I was practically a stranger, with “besos” (kisses) and signing off on even a five minute telephone conversation with ‘muchos abrazos,” (hugs) and effusive wishes for my continued well being. Here is a message from a new friend in Mexico. "Como pasaste navidad y año nuevo? Te deseo todo lo mejor para este nuevo año.Te quiero. Besos. Maria. I was offered both love and kisses. I was severely encantada. Expect it in casual social correspondence. Literal translation: For me, it would be an honor if you would permit me to see you once again. I don’t know your schedule of activities, at what time would you be available? A little much? Not by by Mexican standards. Sometimes I feel like a character in a 19th-century Oscar Wilde novel. Here’s another. “Tengo tantos deseos de aprender contigo el idioma universal, de la amistad. Me encantaria saber de ti. Tú amigo S.
It was a very standard note from the Mexican viewpoint. I dove right into trying this new form too, much to their amusement, immediately ending all my communications with kisses and abrazos. I’ve come to believe most Mexicans, male and female, can construct this type of writing as easily as they can say “buenas tardes.” If I didn’t know this, I’d have a new crush every day...even on the women. On morning I had Sunday brunch with a large group of accomplished Mexican women. I could barely understand the rapid-fire Spanish, but their eyes would soften in greetings redolent with endearments. Words like “cariño” (honey), ”mi amor,” (my love), mi hija (my child), rose up into the air like softly popping soap bubbles throughout the morning. In one of my early blogs, I have a clip of my conversation with a cab driver, a courteous older gentleman. Someone who’d seen the video remarked that he was flirting with me, because he referred to me as “mi amor”(my love) as he hustled me into the cab. I never thought twice about it, so commonly is “mi amor” used in Mexico. My Spanish is still more like beating a drum than making music, but making even a little more music, as my Mexican friends do, is a goal for me worth having. Related links: You hang out with friends differently in Mexico. It's a little uncomfortable at first. I haven't had a friend hang out with me while I put on my make-up and blow-dry my hair since I was 16. The most efficient way to make a friend: Focus. Next up: What will you do with your car while you spend six-eight months in Mexico? Let's think about that. Most Recent: Do I have to pay U.S. income taxes if I live in Mexico? Kerry Baker is a partner with Ventanas Mexico which provides insight and resources to those considering expat life in Mexico, including the recent "If Only I Had a Place" on renting as an aspiring expat. 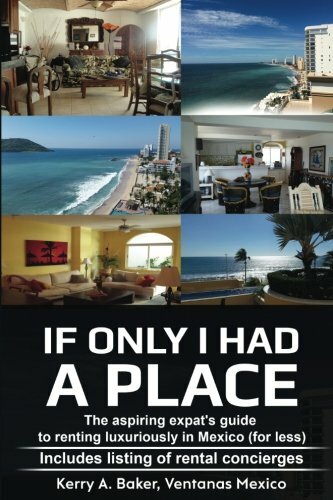 This book will enable you to take advantage of the opporunities and avoid the pitfalls of renting in Mexico. She is also author of the "Interactive Guide to Learning Spanish Free Online," a curation of the best Spanish language tools on the web. You can learn Spanish as an adult. Get started now with a system that enables you to create lesson plans tailored exactly to your needs. Here are some reviews. Do I Have to Pay U.S. Income Taxes If I Live in Mexico?